ITIL provides a framework of customizable best practice initiatives that help organizations consistently deliver high-quality IT services. Effective ITIL implementation adds value to the IT infrastructure and improves business and service delivery. 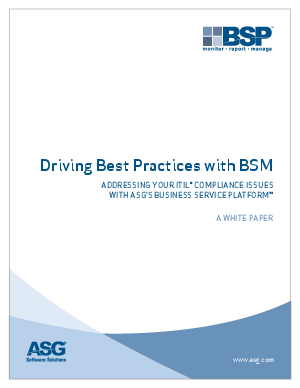 BSM solutions contribute to ITIL compliance by helping organizations manage their underlying technology and by ensuring that their IT infrastructures enhance business performance.